Passed away at his daughter’s residence on November 15, 1998, peacefully, surrounded by his family. We will miss you greatly. Tama Wall, Bev and Nuki, Elaine and Ah-kew Rakei, Phil and Baz, Lou and Tip. Mokopuna Ivana, Ata, Harley, Buster, Nuki-Marie, Philadelphia, Zeal, Harvest, Arden, Jennifer, Zephyer, Ivory-Cliff. 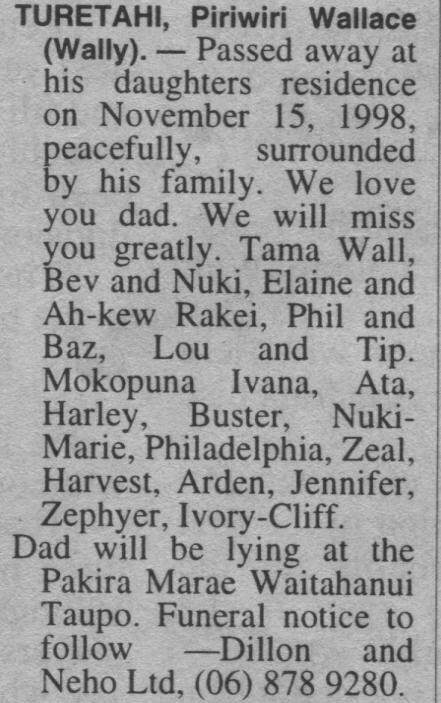 Dad will be lying at the Pakira Marae Waitahanui Taupo. Dillon and Neho Ltd, (06) 878 9280.